It’s a bit too cold to sit on the porch these days, so come on in and let’s talk about what we’ve learned about watering cans so far this week. We now know that many gardeners have more then one watering can, and some gardeners actually collect them, as if they were hoes! You should take a quick virtual trip to Wisconsin to see Linda from Each Little World’s accounting of her watering cans then come right back! We also now know the names of the various parts of watering cans, and when these vessels were first called ‘watering cans’ (1692, in case you've already forgotten). Is there any more we can learn about watering cans? We can learn that there are several similarities between watering cans and gardeners! Watering cans come in all sizes, shapes, and colors, but all basically work the same way. Gardeners also come in all sizes, shapes, and colors, but all basically love working the soil, tending plants, and improving whatever little or big plot of land they garden on. Watering cans, at least metal ones, will rust if old stagnant water is left in them. Gardeners, too, grow rusty if they dwell on old, stagnant ideas. Watering cans work best with a nice rose on the end of the spout to deliver the water in gentle drops. Gardeners, too, can best share what they know with others if they do it gently, giving out advice in small doses. Watering cans are often more cherished when they are old and have a certain aged patina to them. Gardeners, too, are often (or should be) more respected after they’ve gardened for a few (or many) years. Watering cans need to be refilled with water when they run dry. Gardeners, too, need to be refilled when they run dry of ideas by reading good gardening books and magazines, sharing ideas with other gardeners and reading good gardening blogs. And that's how we as gardeners are a lot like watering cans. With this knowledge, can our lives ever be the same again? Very insightful! And I agree...I might be dinged up but I can still do an good job around the garden. Carol — you are a wonder. This essay is a lovely way to begin my morning. And thank you for so generously mentioning and linking to my post. Wise words Carol! You have such a wonderful patina. Hi Carol, a wonderful way to start my day, with your thoughtful wisdom. I really like the *give advice in small doses* part. When teach my grown children and their children about gardening, they want to know everything in one fell swoop, and it just doesn't happen like that. Thanks for that bit of wisdom. Hi Carol, A lovely and gentle essay! Once again you've forged a connection between gardening & life. Wise observations, wittily presented. I'll add another analogy: Watering cans hold something that is potentially valuable and life-giving. The contents must be shared in order to make a difference. So it is with gardeners as well. Great post, Carol. Thank you! Lovely analogies and very apt. We could all learn a lot from our watering cans. And from wise bloggers like you. I commented over at Lind'a about the total absence of plastic watering cans. I wonder if it might not be taboo to even mention plastics, what with all the greenheads now. Not enough watering cans or gardeners in this world! Carol, I like that idea of having a patina--I think I am aging gracefully, becoming "vintage" rather than old. The Haws Practican Watering Can is a general purpose watering can and comes with a plastic-backed oval brass rose plus a right-angle downspout attachment for more precise watering in pots or planters. The rose can be pointed upwards for a gently spray or downwards for a heavier spray. Handy parking point at the base of the spout keeps the rose or downspout within reach when not in use. I liked those comparisons between gardeners and watering cans. By the way, I put pics of some of my hoes on my blog. I love yours, Carol, and there are a couple I want to watch out for. Ha! 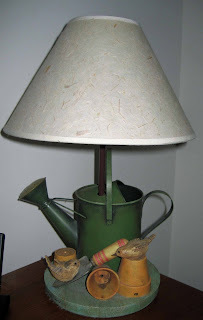 I love the watering can lamp! the socks too!